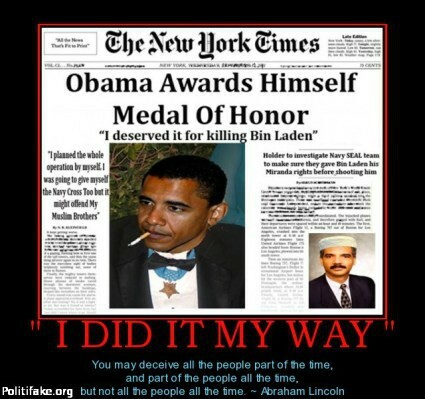 Author Seymour M. Hersh accuses Obama of rushing to take credit for the al Qaeda leader's death. “High-level lying nonetheless remains the modus operandi of U.S. policy, along with secret prisons, drone attacks, Special Forces night raids, bypassing the chain of command, and cutting out those who might say no,” Hersh wrote of the Obama administration’s counter terrorism policies. In addition, the source said that the Obama administration originally agreed to announce bin Laden had been killed in a drone strike rather than shot during an active Special Forces mission. “Obama’s speech was put together in a rush,” Hersh wrote of Obama’s announcement of Operation Neptune Spear to Americans. “This series of self-serving and inaccurate statements would create chaos in the weeks following,” he added. “This was not the fog of war,” Hersh quoted his anonymous source as saying. “The fact that there was an agreement with the Pakistanis and no contingency analysis of what was to be disclosed if something went wrong – that wasn’t even discussed,” the source added. “And once it went wrong, they had to make up a new cover story on the fly,” the source said of Obama’s advisers’ response to his speech on the raid, Hersh wrote. Hersh’s report also accuses the Obama administration of embellishing the details of the raid itself and presenting al Qaeda as a bigger threat than it actually was before bin Laden’s death. The White House did not comment on Hersh’s claims. The lying and deceit continues and is another reason the people no longer believes their leadership at all levels.. Obama is the leader of the culture of corruption.